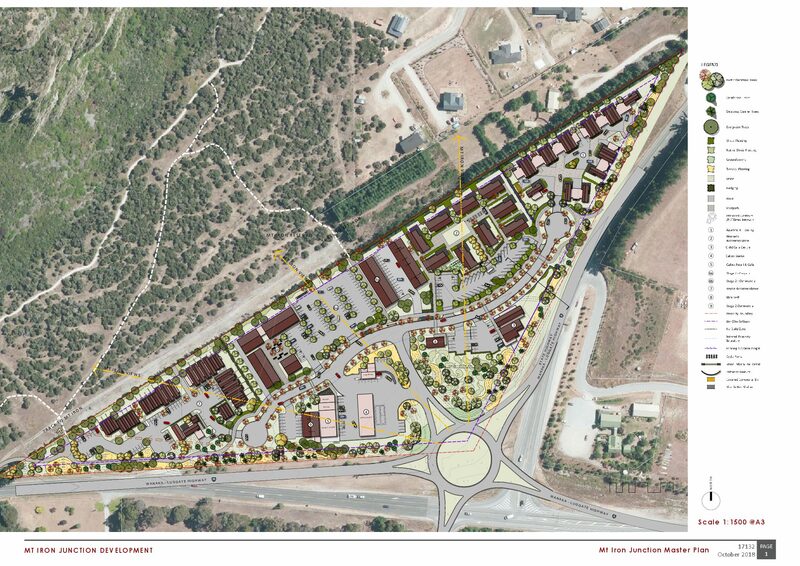 A proposed new development designed to alleviate some of Wanaka’s growth and transport issues has been unveiled today. Mt Iron Junction Ltd has lodged a resource consent application with Queenstown Lakes District Council for a proposed mixed-use development on 6ha of unused land at the base of Wanaka’s Mt Iron, bounded by State Highways 6 and 84. The proposed development, Mt Iron Junction, will provide terraced housing, relieve accommodation and transport concerns, and better-connect the residents of Upper Clutha. Mt Iron Junction comprises terraced housing in the form of 17 two- and three- bedroom two-storey villas, as well as Wanaka’s first dedicated workers’ village with accommodation and amenities for up to 90 seasonal and long-term working residents. A major aspect of the development is a much-needed roundabout that will vastly improve road safety at the SH6/SH84/Riverbank Road intersections and seamlessly connect the town’s existing roading network. Mt Iron Junction will also introduce new cycleways and walkways to link Albert Town and Wanaka. Commercial development includes an upscale motel, a childcare centre, a service station, a mini-golf course and a small, niche retail area. Mt Iron Junction Ltd directors are long-time local Steve Schikker and Peter Greene, who has long-standing local interests. Passionate about Wanaka, they understand the need for a community-focused development that provides a solution to growth challenges and achieves a positive outcome for the future of Wanaka. “We envisage Mt Iron Junction to be an attractive, thoughtful and functional entrance to Wanaka – one that complements the natural environment, existing urban and commercial development, and community infrastructure, while offering the necessary facilities for future growth,” Schikker says. Mt Iron Junction anticipates construction will begin as soon as practicable, subject to the required consents. Images (artist’s impressions) can be downloaded here.